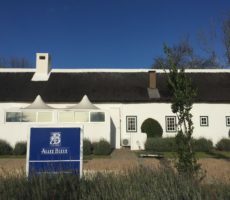 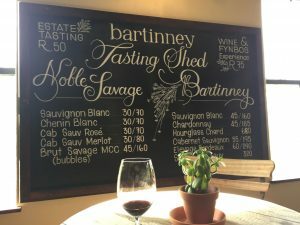 Bartinney was my third and final tasting of my day out to the Banhoek Valley area to the East of Stellenbosch at the base of the Helshoogte Pass. 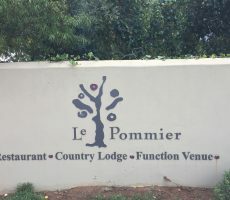 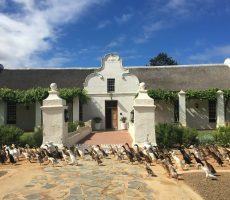 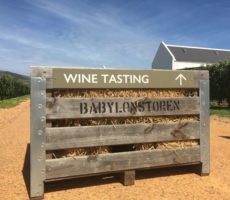 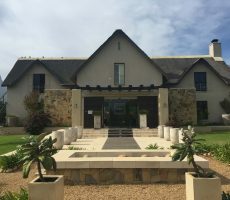 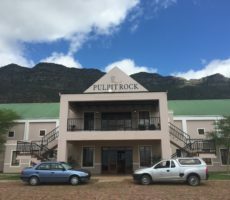 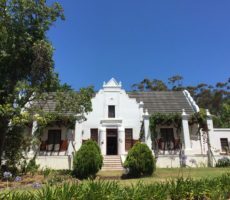 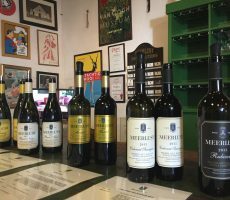 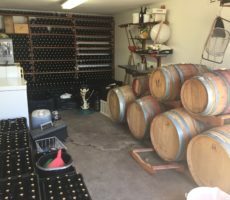 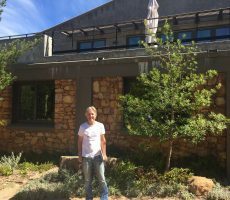 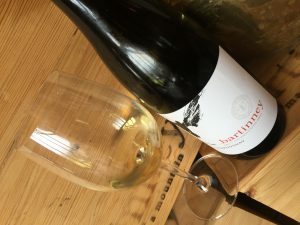 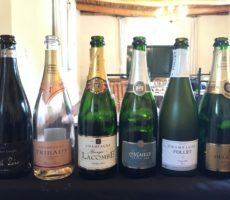 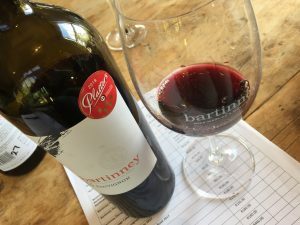 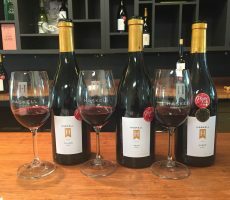 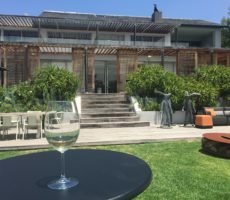 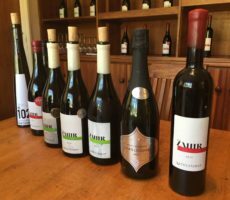 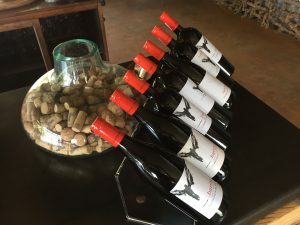 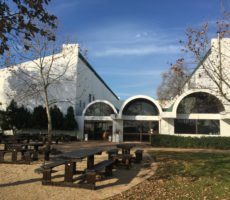 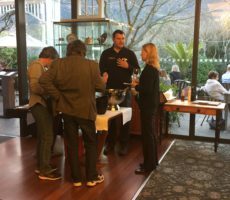 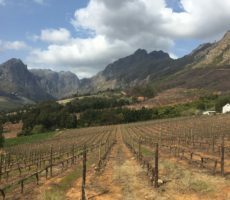 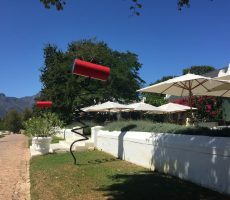 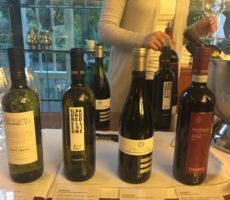 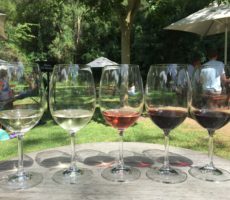 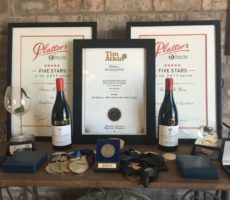 I had already been to the excellent Oldenburg Vineyards and simple Le Pommier but had wanted for a long time to sample the Bartinney wines. 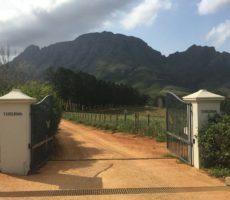 I had tried a year ago before having checked opening times for a Friday only to find the gate closed on my arrival, it being Good Friday. 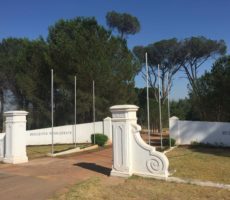 The white entrance gate lies close to the road. 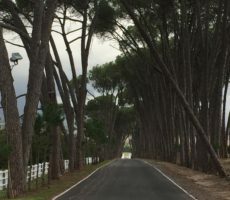 It leads to a narrow lane, trees beside, that is paved to start but turns to light gravel as it passes another gate. 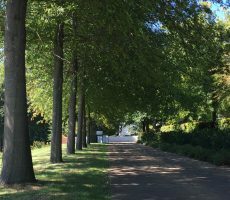 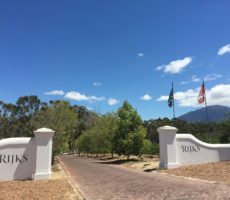 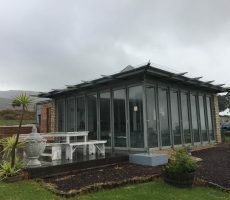 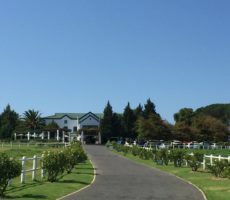 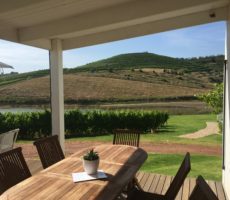 The road opens up to a large open parking area that has vineyard cottage guest houses on one side and an open view down the valley on the other. 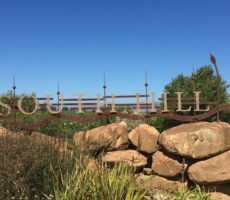 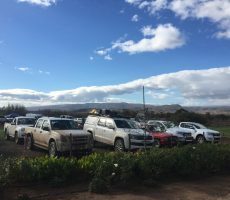 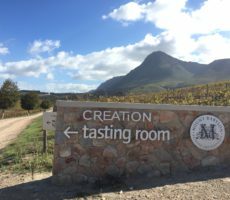 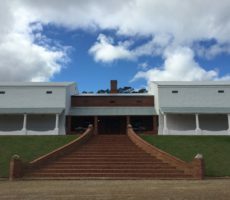 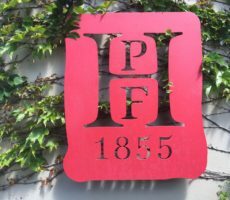 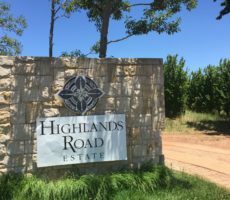 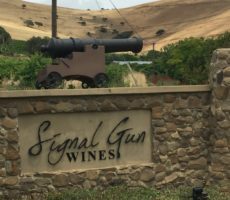 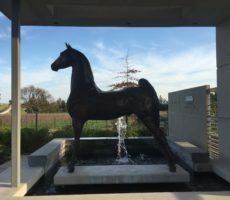 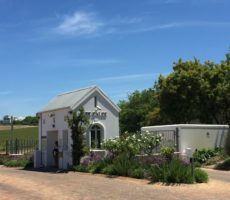 It was not immediately clear where the Tasting Building was – or, as it is called, the Tasting Shed – but I soon found the signs and walked down the small slope to it. 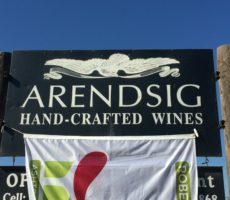 I met Brendt, Tasting Room Manager, and my host for the visit. 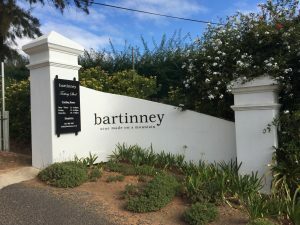 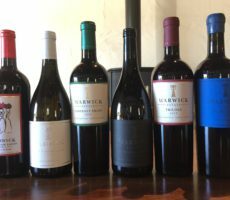 Bartinney wines for tasting fall into 2 main collections (R50 for 4 wines): the Bartinney Range and the Reserve Range. 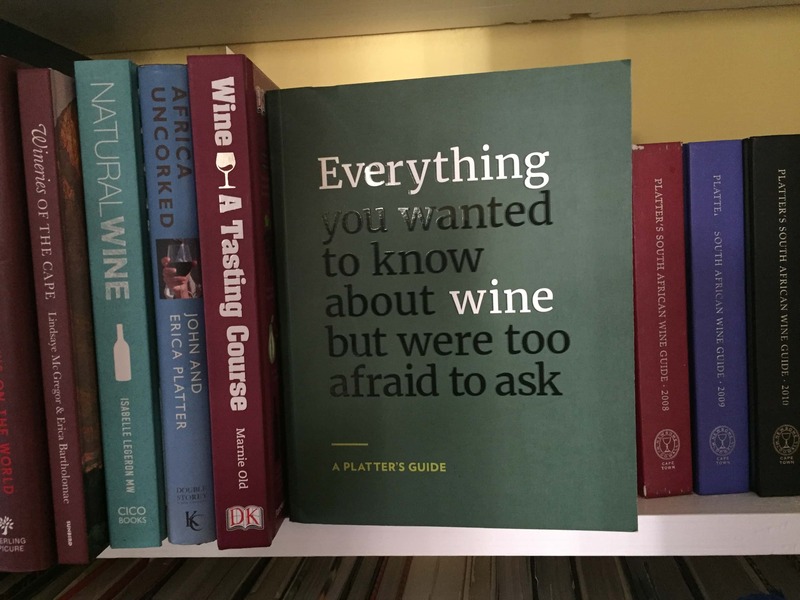 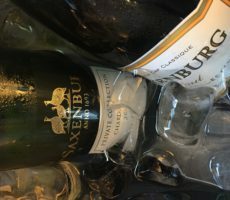 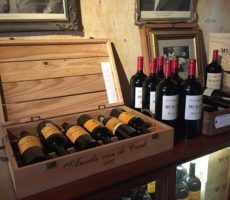 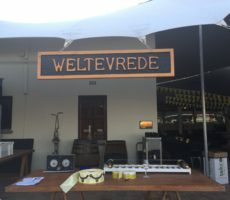 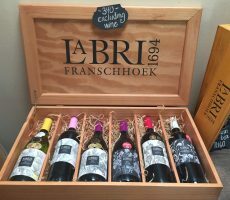 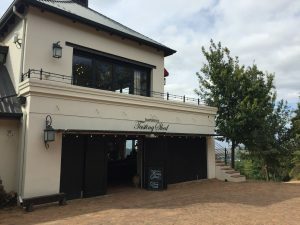 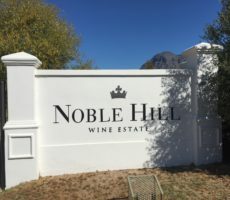 There is the entry, Noble Savage Range that is sold at the Bartinney Wine & Champagne Bar in Bird Street in Central Stellenbosch together with Montegray Vineyards wines that are sold next door at the Montegray & Independents Tapas Bar. 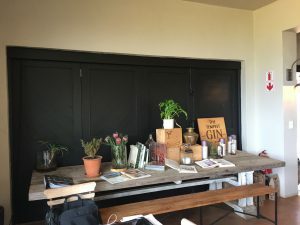 Co-owner Rose Jordaan has crafted The Tempest fynbos gin but I did not taste. 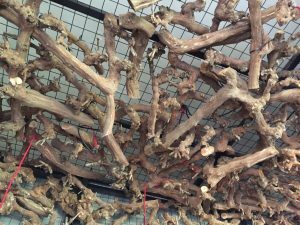 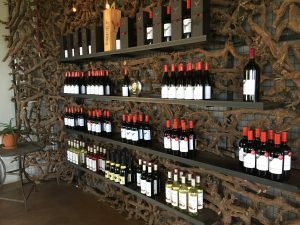 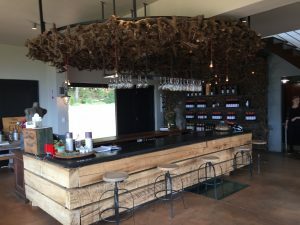 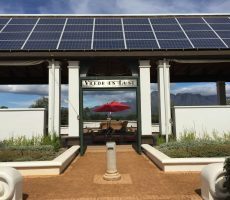 The Tasting Shed has a rustic feel with its use of wood from old oak from vats, vintage chairs, and uprooted Sauvignon Blanc vines. 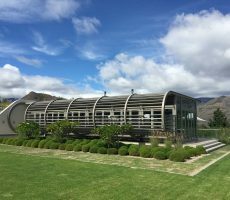 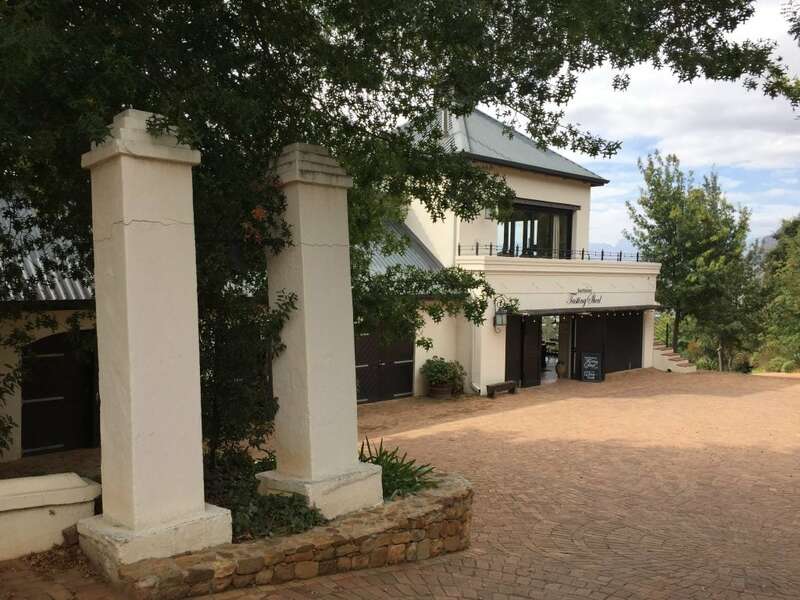 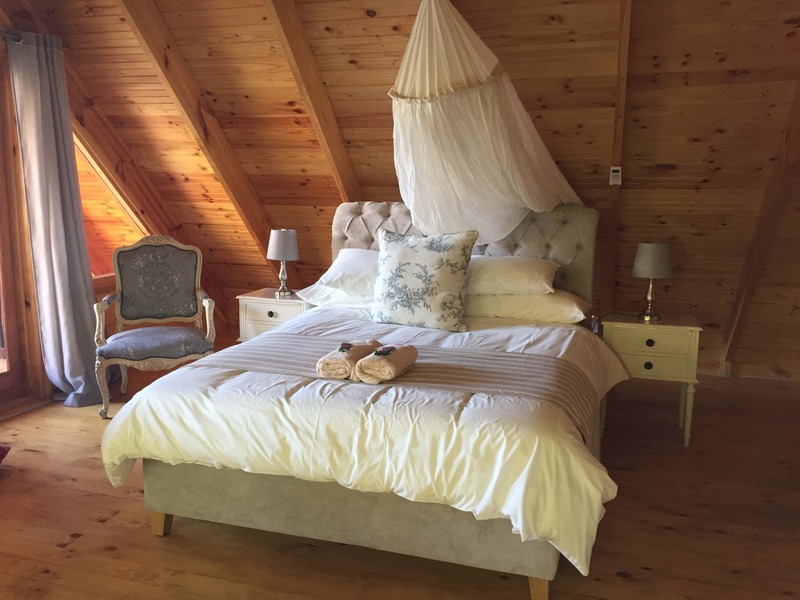 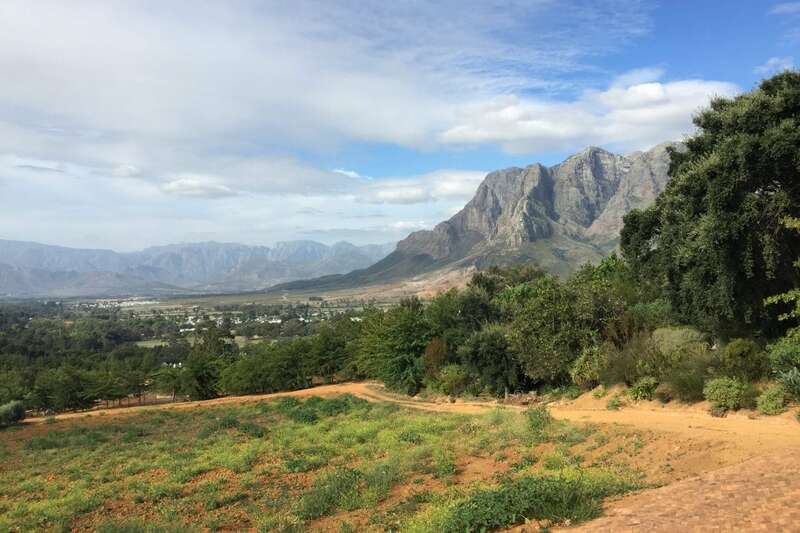 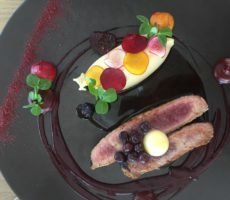 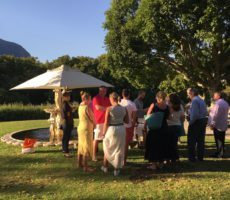 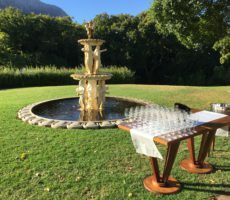 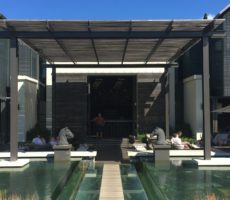 It makes for a relaxed environment with its spectacular views down the steep slopes overlooking the Banhoek Valley. 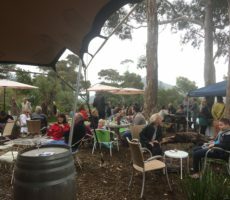 The Tasting Shed is also a venue for live music on Friday evenings. 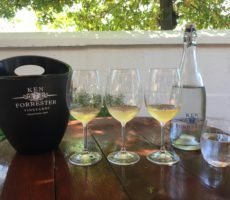 I began with the Sauvignon Blanc and 2 Chardonnay. 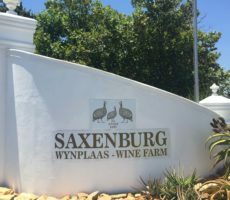 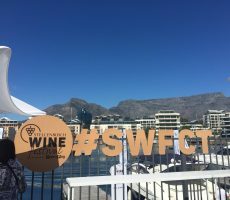 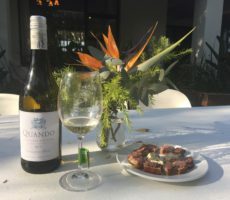 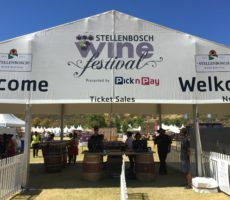 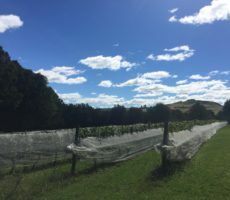 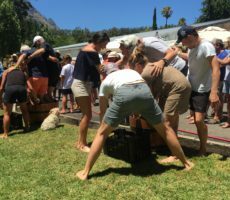 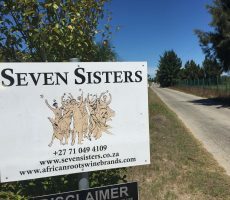 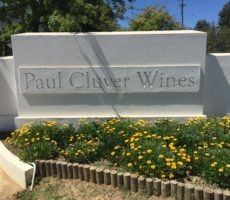 The pale straw coloured Sauvignon Blanc, from grapes grown on cooler, elevated North-facing slopes, was made in tropical style with aromas of fresh guava and melon. 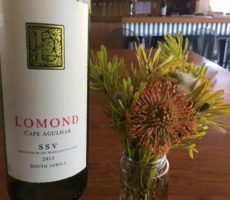 Like many of the fruitier kind, the acidity was slightly below typical tartness to make for a crisp and refreshing wine. 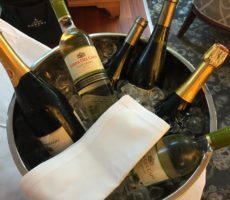 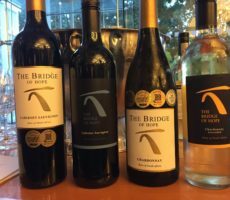 I tasted the 2 Chardonnay, from different ranges, side by side. 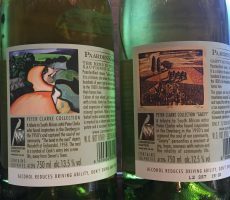 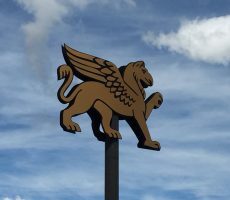 The wines sport a simple label that features a winged figure called Élevage. 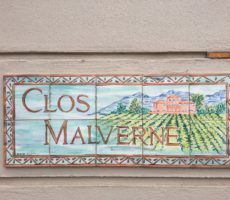 Élevage is the French term for the stages between fermentation and bottling and includes the careful, selective, artisanal blending of raw wines to make the final product. 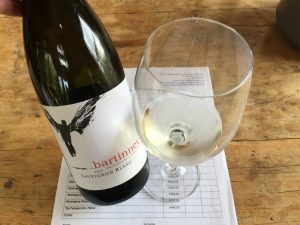 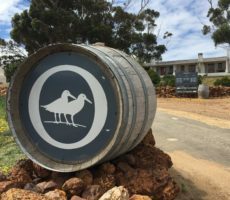 The Bartinney Range wine, with black winged logo, had a delicious smooth texture that complemented simple ripe yellow apple and vanilla aromas. 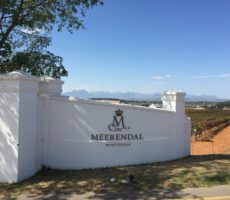 The wine, matured for 11 months in 30% new and 70% 2nd/3rd fill barrels, showed just the right amount acidity to add grip to the mouthfeel. 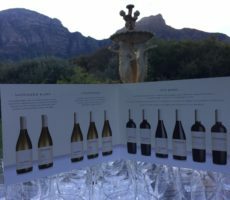 The Hourglass Chardonnay from the Reserve Range, with white winged logo, was a hefty R620 and served via Coravin. 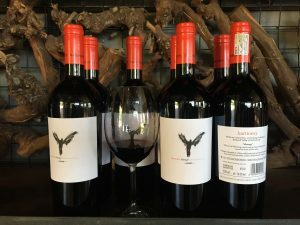 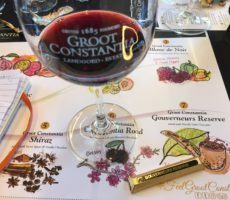 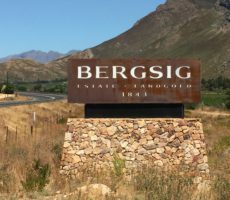 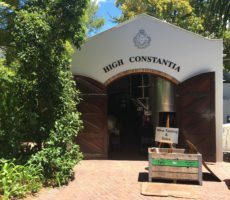 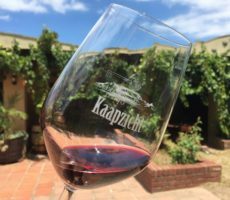 It was the first flagship wine to be made (700 bottles) using the best grapes from a specific block of high altitude vines that is naturally shaped like an hourglass, hence the name. 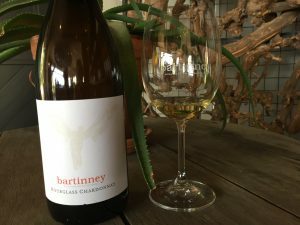 The Chardonnay was rich and balanced on the nose, perhaps a little less intense than the Bartinney sibling, but excelled on the palate. 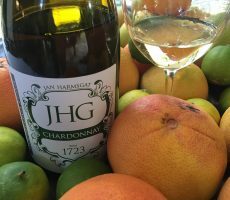 The intensity of fruits grew on the palate that was well balanced with a fabulous rounded, smooth texture. 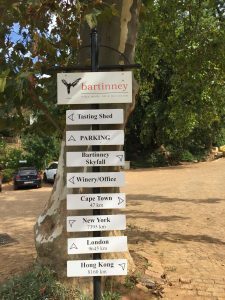 Bartinney dates back to 1920 when a Harrods Director chose to settle in ‘the most beautiful valley on earth’. 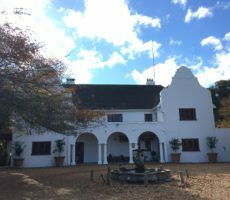 The Manor House was built 3 years later. 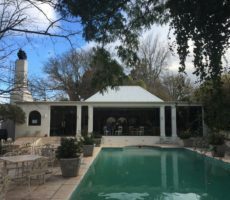 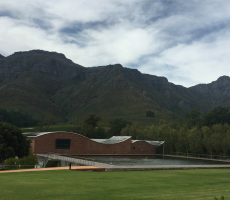 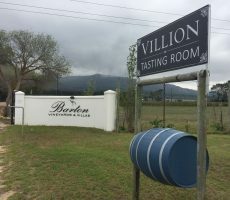 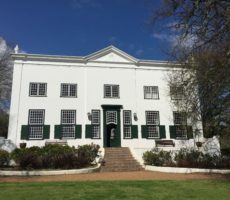 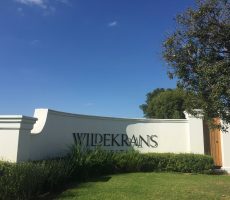 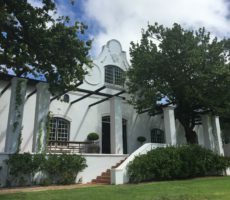 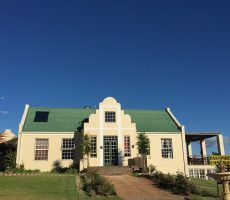 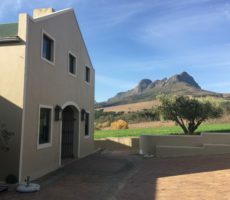 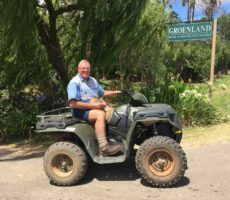 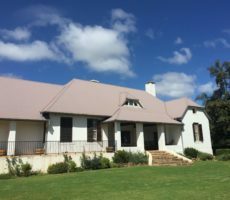 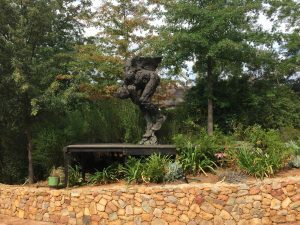 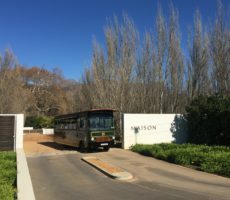 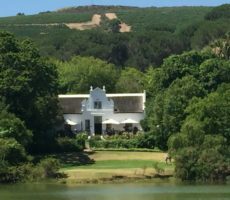 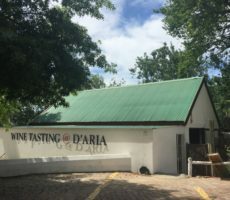 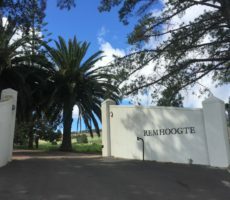 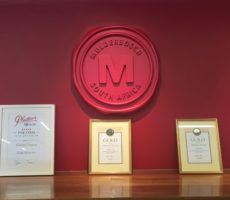 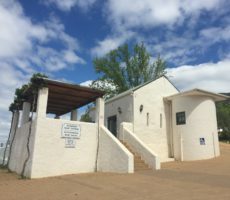 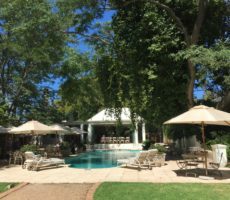 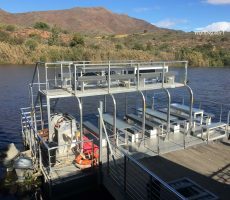 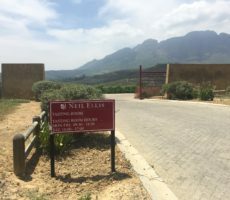 The property has been owned by the Jordaan family since 1953 with Michael and Rose Jordaan being the 4th owners from 2006. 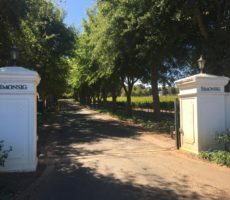 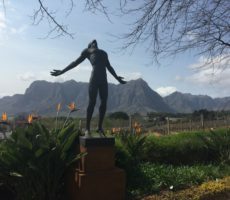 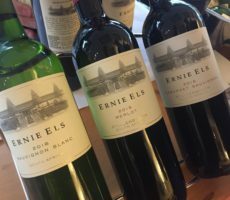 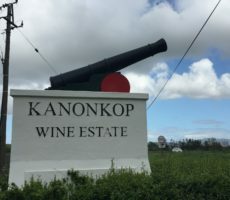 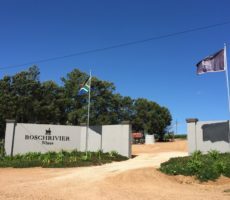 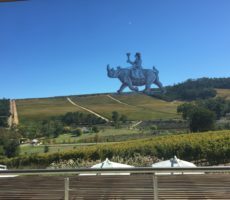 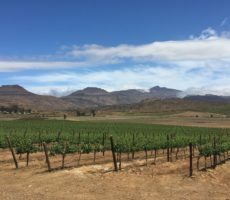 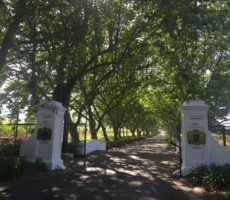 The estate grows just 3 cultivars – 12 hectares of Cabernet Sauvignon and circa 3 hectares each of Sauvignon Blanc and Chardonnay – on the 28 hectare farm, with the remainder set aside for conservation and sustainability. 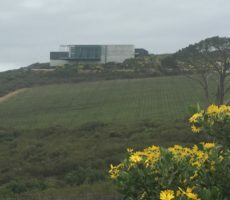 The vineyards lie between 450 and 550 metres above sea level, on steep slopes of up to 45°, and are nurtured using biological pest control. 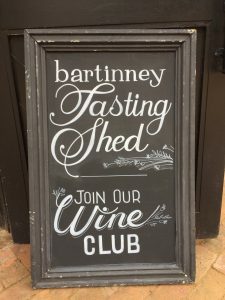 No wonder Bartinney has the strap line of ‘wine made on a mountain’. 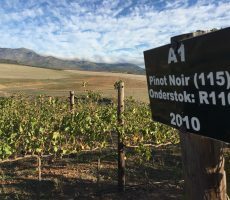 Cabernet Sauvignon is grown on the lower slopes of the Botmanskop Mountains and the basis for my final 3 tastings. 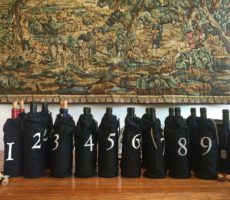 It was good to compare the 2013 and 2014 vintages. 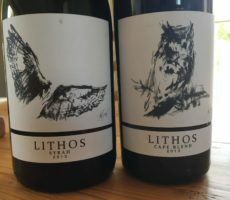 Both were full bodied wines, aged for 18 months in 30% new and 70% 2nd/3rd fill barrels, and served at the right temperature. 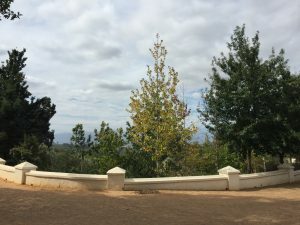 They were different in character. 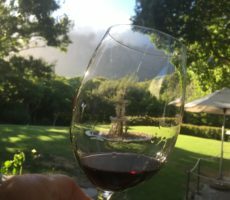 I preferred the bramble and blackcurrant fruitier yet slightly earthy 2013 wine because of its smoother and more rounded tannins. 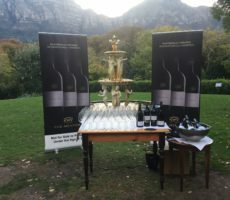 The younger, 2o14 vintage – a Platter 5* winner – was greener on the nose with hints of fruity spiciness. 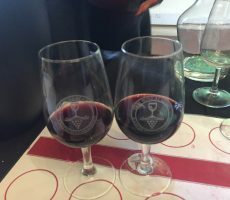 The wine was more tannic and structured on the palate with the balance favouring tannins more than fruit. 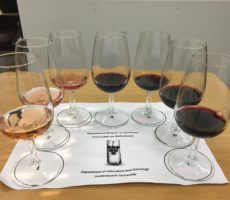 The final wine of the tasting was the left bank Bordeaux-style blend made from 4 varieties. 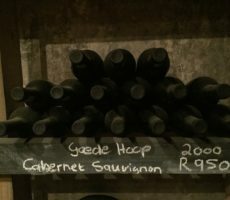 Cabernet Sauvignon was the majority grape (75%) and so the wine showed much of the character of the single cultivar wines. 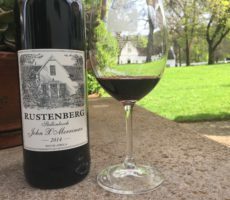 It vied with the 2013 Cabernet Sauvignon as my favourite wine. 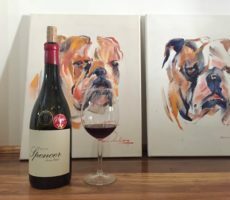 Rich, bold and alcoholic, the nose was full of bramble, cassis and dark plum aromas. 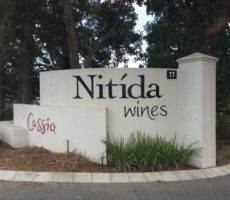 The fullness followed through to the palate that had rounded tannins in good balance with the fruit flavours. 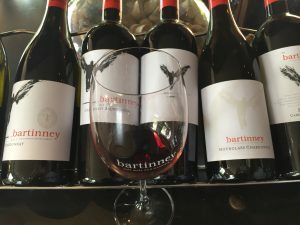 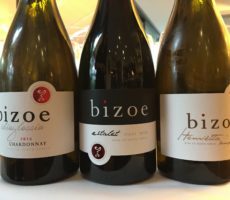 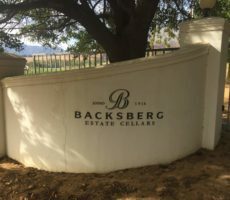 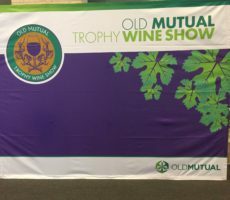 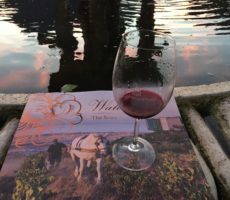 Bartinney showed that it is sometimes better to make fewer wines of quality that a broader range with quality compromised. 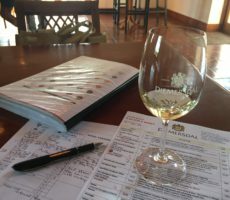 The wines were well made and presented, even if Brendt disappeared for moments on various errands during the tasting. 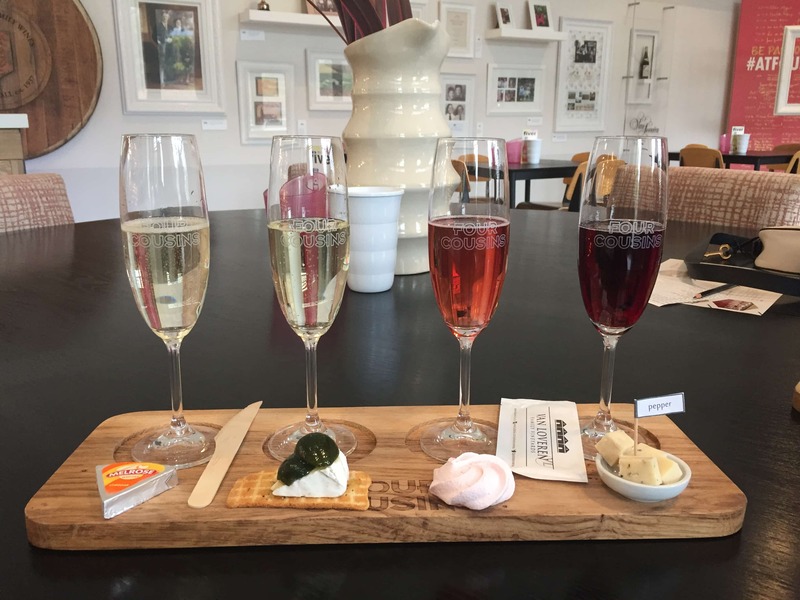 I recommend a tasting visit. 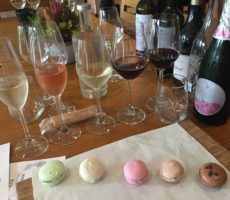 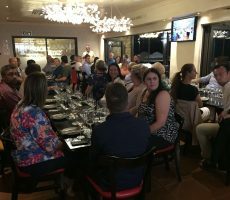 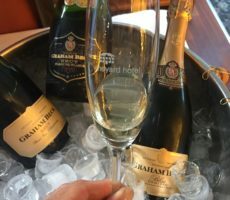 I left feeling that there was a certain je ne sais quoi about the tasting experience. 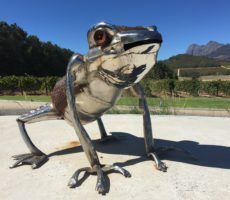 There was a funky emotion that I could not quite put a finger on. 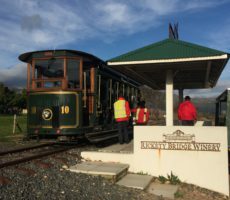 Maybe it was something of the steep slopes and the mountain air ….